As posted by Halifax Herald News, the September 23, 2013. Clarence Deyoung understands what $35 can buy for a needy kid in a country like Sri Lanka. The list goes something like this: A ground mat, sheet, towel, pillow and pillowcase. One pair of new shoes. Two skirts for the girls. Two pairs of shorts for the boys. Two T-shirts. Seven school books. A mosquito net to ward off malaria-carrying insects. “The smile that $35 brings to these kids’ faces is unbelievable. It’s like Christmas over and over again,” said Deyoung, who just returned from his 26th trip as a volunteer with the Canada-based charity Sleeping Children Around the World. Deyoung, a retired businessman from Pomquet, first heard of Sleeping Children Around the World (www.scaw.org) from his daughter, who had learned about the organization at school. The idea appealed to him, he said. A $35-donation provides one bed kit with bedding, clothes and school supplies for a child in a developing country. Volunteers who distribute the bed kits pay their own travel expenses and no part of the donation money is used to cover administration costs, he said. In 1989, after meeting the charity’s founders, Deyoung went on his first trip. Now 26 trips later, Deyoung has to stop to think when asked what countries he’s visited. “India, Bangladesh, Honduras, Nicaragua, Ecuador, the Philippines, Togo and Sri Lanka,” he says. There have been five trips to India. This was his fourth trip to Sri Lanka. He was two weeks in that country, with the other volunteers. It took 26 hours to get to Sri Lanka from Toronto, and then there was a nine-hour bus drive from its capital to the rural areas where 4,000 kids waited for their kits. The kit items were purchased locally by Rotary club volunteers there, after consulting with parents to see what the children needed. The Rotary, using the charity’s criteria, also picked the recipients. Sleeping Children Around the World volunteers were on hand to make sure the kits were distributed properly. They also take pictures of each child with the donated kit, which is sent back to the kit’s donor. “We go over there as travelling volunteers to be the eyes and ears of our donors. We want to see that it’s a good bed kit. We want to see that it’s a needy child. 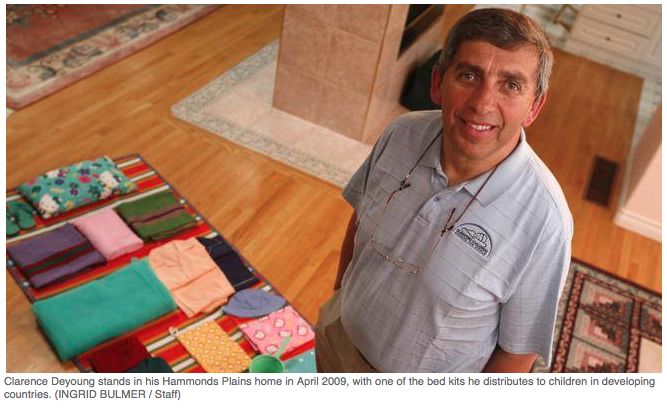 We want to see that the items in the bed kit are of good quality,” he said. This trip, the children’s feet were measured for shoes. Deyoung says he watched as many of the children, wearing the only clothes they owned, picked out the first pair of shoes they’ve ever worn. Deyoung is already thinking about his next trip with the charity — likely back to Sri Lanka. In the meantime, there are plenty of local projects that he also is involved with. And that comes with its own reward, he said, recalling the looks on the children’s faces in Sri Lanka. “It just gives these people such a boost and a little bit of hope that there is someone out there who cares about them,” he said.